For Evgeny Afineevsky, history is written by rebels, whether they are victorious or not. His unsparing and unforgiving documentary Cries From Syria puts the six-year, still-raging Syrian conflict into historical and personal context, from its idealistic origins during the Arab Spring uprisings to the incomprehensible quagmire of civil war and destabilizing exodus of refugees, part of the largest migration since World War II. Events are presented from the perspective of the Syrian opposition, who seek the removal of President Bashar al-Assad and have formed the Syrian Free Army. It’s a ground-level point of view that effectively captures the homegrown revolution but only marginally addresses the outside militia groups and foreign governments (Iran, Turkey and Russia) that are shaping Syria’s future and participated in the latest round of peace talks last month. Afineevsky (Winter on Fire: Ukraine’s Fight for Freedom) constructs a methodical narrative fueled by outrage. In the chaotic euphoria of the initial protests, activists recall the crackdown by government enforcers, who employ the dirty war tactics of detention and disappearance, torture and execution. His interviews are informative and captivating, but the film’s gut-punch immediacy comes from the astounding visuals caught by participants on digital cameras and cellphones, including shocking images of Assad’s torturers at work. That’s only one of the horrors exposed in Cries From Syria. 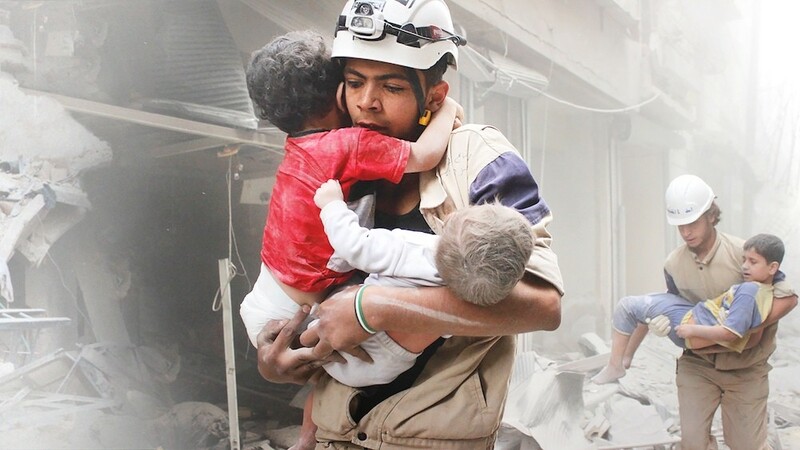 Afineevsky uses harrowing images of the regime’s barbarism as a visceral counterpoint to the way organizations like the United Nations treat the Syrian conflict as a conventional war. The UN sends in a hazardous-materials team to test for the residue of chemical weapons and focuses on securing those materials by determining the exact quantity of Assad’s stockpile. For Afineevsky, the point is that the government had no qualms about utilizing chemical weapons, toxic substances so devastating that they’ve been banned for nearly a century. He shows a hospital ward full of the gasping, flailing victims of a sarin gas attack, the desperate staff trying to wash the poison from patients’ skin. It’s a soul-crushing scene: families painfully dying by drowning on dry land. To show the toll of targeted and seemingly indiscriminate airstrikes, Afineevsky uses extensive footage of Syria’s bombed-out apartment blocks, skeletons of shredded cement and rebar that hold up until one final explosion destroys a building’s structural integrity and buries residents in jagged rubble and thick gray dust. He expresses a particular disdain for Russian bombers, which have caused widespread devastation to civilian areas under the guise of fighting terrorists (and are so effective that they’ve helped turn the war in Assad’s favor). Afineevsky has found passionate and articulate interview subjects, especially Kholoud Helmi, editor of the underground newspaper Enab Baladi, and soccer goalie-turned-rebel leader Abdul Baset al-Sarout. He illustrates the demonization of refugees by incorporating the perspective of children and teenagers seeking asylum in Europe, directing his anger at the regime’s victimization of its most vulnerable. 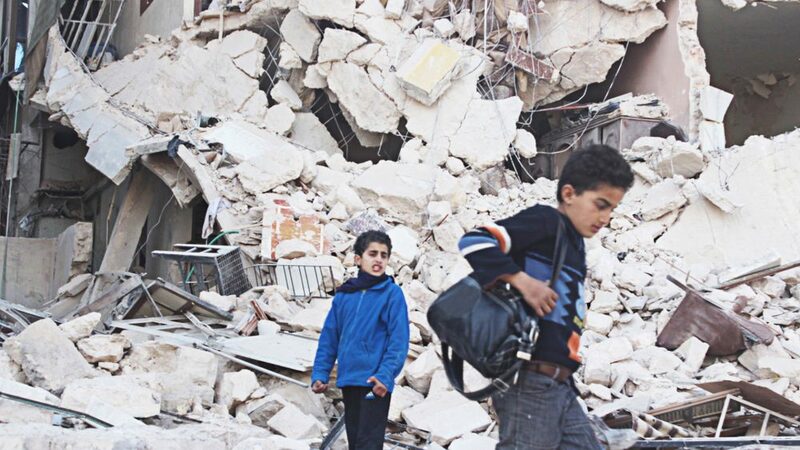 Children have been on the front lines of Assad’s war on Syrians, slaughtered by a second-generation dictator willing to kill his country’s future to retain power. Cries From Syria is a distressing chronicle of how this happened and a plaintive wail to make it stop. First published in The Village Voice, 2017.